Annette Bening, one of our most enduring film stars, is better than she’s ever been in “Film Stars Don’t Die In Liverpool” and in any other year the Oscar-less also ran would be awarded the Best Actress trophy for her astonishing portrayal of dying film star Glorida Graham. Graham was a handful by all contemporary accounts, and was as tempestuous in real life as the characters she played in the movies. And she drank. She wasn’t Marilyn Monroe, a rival, but she did have her own Oscar for Best Supporting Actress in “The Bad and the Beautiful.” What Annette Bening does here in this straightforward biopic is to bring us into Graham’s vulnerability as well as her thwarted talent, as the chain smoking she has been doing all her life begins to take its awful toll. It’s in her last years that she begins to take on a May-December flirtation with this young, YOUNG man, the now-hunky and all grown-up “Billy Elliot” star Jamie Bell. And then Gloria gets lung cancer and the film turns dark. And very moving as events build to their tragic inevitable climax. Bening is convincing in every aspect of the doomed Graham’s life. It is her greatest performance, and in any other year, she would be finally awarded the Best Actress Oscar that has eluded her all her life. She’s been nominated four times! This year, however, has seen a plethora of brilliant actresses storming the gates of AMPAS and there’s only five slots. Which seem destined to be taken by Sairose Ronan( Lady Bird), Sally Hawkins (The Shape of Water), Frances McDormand (Three Billboards Outside Ebbing, Missouri) and Meryl Streep (The Post). Manola Dargis of “The New York Times” slammed her five ways to Sunday just today, so there MAY be room for Bening if Kate Winslet doesn’t slip into Fifth Position.. But if Annette Bening does get in here, her performance as Gloria Grahame, in “Film Stars Don’t Die in Liverpool” is her best ever, she COULD win. There’s a great positive sentiment surrounding Bening. She’s made a success of her long-term marriage to Warren Beatty. That ALONE is worthy of a major award. AND she’s now President of the Academy itself. That could cut both ways. But Annette completely won me over. 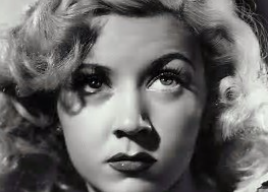 You’ll never be able to look at a Gloria Grahame film again without bursting into tears. As I did. Golden Globe Nominations Out!”Shape of Water” leads with 7!